Hard-nosed, hard-drinking but never hard-boiled - here's the crusading cameraman of the Morning Express hot on the trail of sixteen rip-roaring cases. 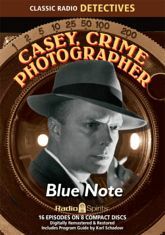 It's Casey, Crime Photographer! Staats Cotsworth stars as Casey, with Jan Miner as Ann Williams, Bernard Lenrow as Captain Logan, and John Gibson as Blue Note bartender Ethelbert - who doles out the drinks while jazz great Herman Chittison plays the piano. Maurice Tarplin, Mercedes McCambridge, Parker Fennelly, Elspeth Eric, Santos Ortega, Ted de Corsia, and more populate the city and perpetrate the crimes - including cases of kidnapping, corruption, arson, blackmail, robbery�and murder.